On Friday September 25th, librarians, archivists, and other information professionals from the northeast with an interest will gather in the Grand Reading Room of the Claire T. Carney Library to discuss current issues in the field of digital stewardship and preservation. 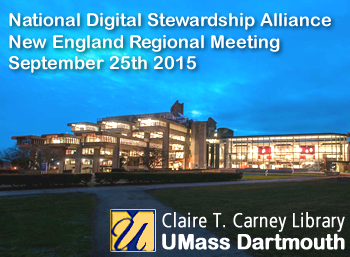 The event is the third annual New England National Digital Stewardship Alliance regional meeting, the oldest regional NDSA meeting, co-hosted this year by UMass Dartmouth and Brown University. The program will contain a series of talks from experts in the field and breakout discussion sessions for those involved in the work of digital stewardship to participate in. Among the presenters is National Chair of the NDSA Coordinating Committee Dr. Micah Altman, Director of Research and Head/Scientist for Program on Information Science at the MIT Libraries. Other speakers include practitioners from Brown University School of Public Health, CodedCulture, Harvard Medical School, WGBH, and the 5 residents of the National Digital Stewardship Residency – Boston Program. This entry was posted in Library Instruction, Library Staff News on September 23, 2015 by cmcneil.